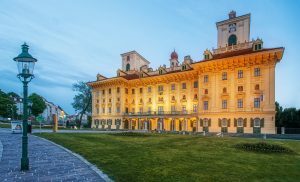 Built in the thirteenth century Esterházy Palace in Eisenstadt is one of the most beautiful baroque palaces in Austria. The historical and spacious ceremonial rooms are still available today, adding their own unique flair as an exclusive setting for different events. In 1649, the castle came into the hands of the Esterházy family and in the second half of the seventeenth century was remodelled under Paul I into a baroque palace. It was to be the main residence of the family for more than 300 years. 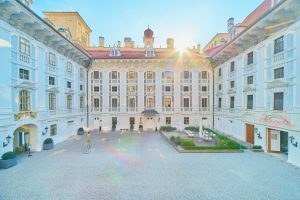 Today the Palace is owned by the Esterházy Private Foundation, offering guests from all over the world a wide-ranging programme of events and cultural exchange. The Haydnsaal is the showpiece jewel of Esterházy Palace and will also become the central point of ICOAS, where the plenary sessions will take place. Its size and interior design and appointments are a manifestation of the political, economic and cultural significance of the Esterházy princes. Today it is hailed as one of the most beautiful and outstanding concert halls in the world, above all because of its acoustics. 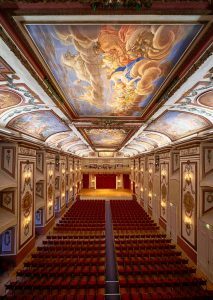 Its name goes back to the renowned composer Joseph Haydn, who was in the Esterházy family’s service for almost forty years and composed many of his works in Eisenstadt. Please click here for more detailed information on the Esterházy Palace.